Artificial Intelligence is one of my favorite things to talk about … It makes so much possible! In a previous article I mentioned that forecasts expect AI to impact or eliminate up to 50% of current jobs. Nevertheless, I think that is the start of the story. The ultimate impact will be bigger and more positive than most people expect. Personally, I believe that freeing us to do more has always been a boon to society. Electricity put a lot of people out of work as well … but, look what it made possible. We'd be naive to think A.I. isn't going to influence the job market, but that doesn't mean you can't navigate that shift. There are several turning points in our history where the world changed forever. Former paradigms and realities became relics of a bygone era. Today, we're at another turning point. Tomorrow's workforce will require different skills, and face different challenges than we do today. You can consider this a Fourth Industrial Revolution. Compare today's changes to our previous industrial revolutions. Third industrial revolution – The world wide web and computers connect the world together heralding the digital age. Each revolution shared multiple similarities. They were disruptive. They were centered on technological innovation. They created concatenating socio-cultural impact. The fourth shares all the same hallmarks. We're harnessing new technologies like A.I., the IoT, renewable energy, and quantum computing. Automation is going to reach a new paradigm in this revolution, but there will also be an explosion of new fields, new markets, and new necessary skillsets – it's going to impact the world as holistically as electricity. How will humans create value in an increasingly automated world? Guthrie Jensen has 10 skills they believe will become more important in the new world, five industries they think will grow the most, and another 10 jobs they think will be the most "in-demand". Check out the infographic below (click it to see the whole thing). Robots can do many things, but they've yet to match the creativity and emotional insight of humanity. 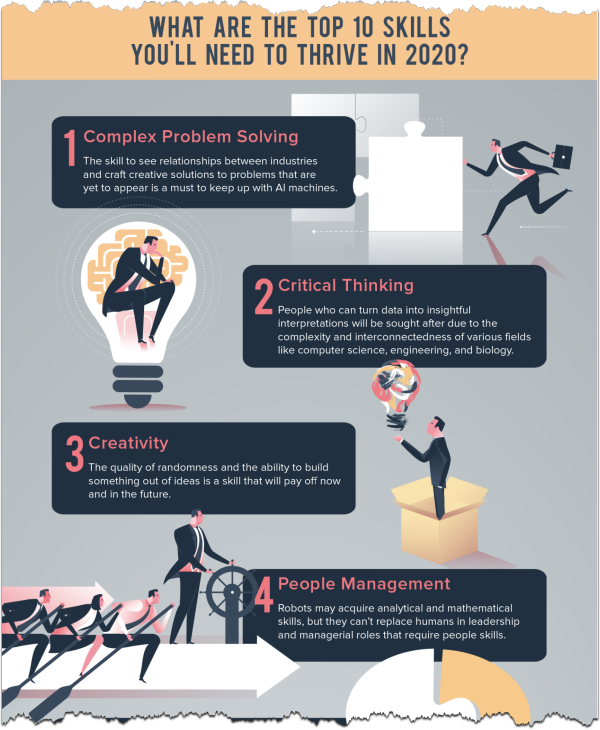 As automation spreads to more jobs, the need for management, creativity, and decision-making won't go anywhere … they may be bolstered by data analytics, but they won't disappear. Our uniqueness and flexibility rightly protect our usefulness. AI and automation free us up to be our best selves and to explore new possibilities.